If you are having problems using the global search feature in GrabIt it could be related to Avast Anti-Virus Protection. If you are using Avast please shut-down the NNTP scanner. After disabling the NNTP scanner you will be able to access the Grabit Search Feature and the Browse Function. These instructions apply to Avast Free, Home and Professional Version on Windows XP, Windows Vista and Windows 7. 1. Double Click the Avast icon in the system tray. 2. 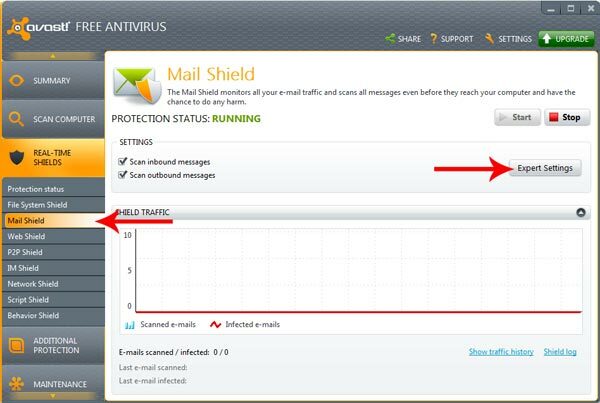 In the Real-Time Shield drop down in the left menu select “Mail Shield” then click on “Expert Settings”. 3. When the “Expert Settings” window appears uncheck the “Scan newsgroup messages (NNTP)”. 4. 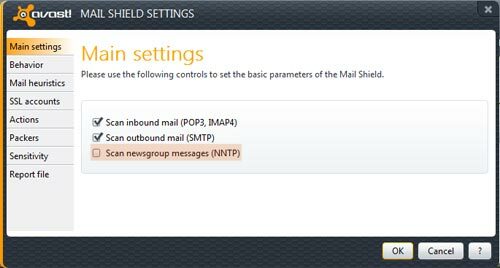 After unchecking “Scan newsgroup messages (NNTP)” click on “Ok” and close out of Avast administration area. 6. You will now be able to use the search and browse functions. 7. With the NNTP Scanner turned off, insure that Avast is configured to scan incoming files.